The Orkney Islands lie 6 miles off Scotland's north coast in Britain. On South Ronaldsay an event takes place which is now totally unique to this area. A ploughing match is held for boys using miniature ploughs, these being exact replicas of the ploughs which would have been pulled by the horse in days gone by. No one knows exactly when the competition started, but it is almost certain to have been in the latter half of the nineteenth century. These first ploughs would have been very basic - perhaps only a stick with part of a cloven hoof of a cow or ox to make a mark in the land. Proud fathers obviously improved these ploughs and encouraged the boys efforts, which in turn led them to having their own competition. The ploughing would have been done in the springtime, in the fields where the rains would have left a fine silted patch suitable for the smaller ploughs. Several different areas of South Ronaldsay (and a few other parts of Orkney) held a competition but by this time it had moved to a beach with suitable sand to plough in. 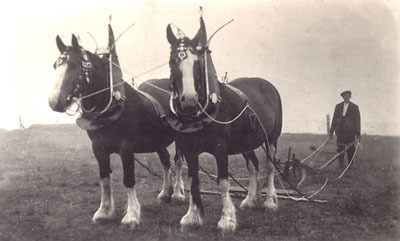 In common with the real horse ploughing matches, little 'horses' started appearing to be judged. These 'horses' would be younger siblings, suitably transformed into a horse by wearing perhaps a collar, chains, other straps and a tail to imitate the Clydesdale horse in harness, although these little 'horses' never actually pulled a plough. Since these humble beginnings the event held in the village of St. Margaret's Hope - usually on the third Saturday in August- has become a most spectacular and colourful occasion with the 'horses' being displayed and judged before the boys make their way to the nearby Sands o'Wright for the ploughing competition.